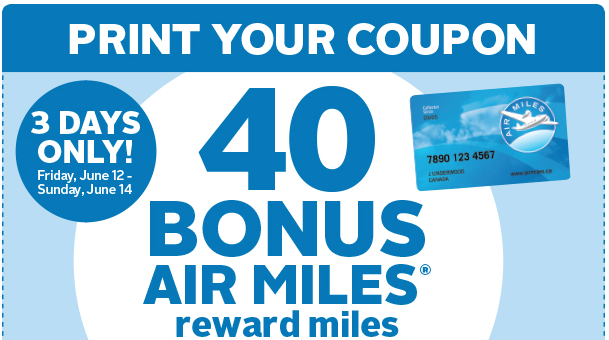 Earn 40 bonus AIR MILES when you spend $40 or more at Rexall this weekend. Print this coupon. You can earn 2,000 bonus SCENE points if you spend $200 on TaylorMade products at Sport Chek until June 29. Find out more here. AIR MILES sent out an email that they have discounted the price for buying AIR MILES Reward Miles. The price is 20 cents per miles instead of 30 cents until June 28th. Since we value AIR MILES Reward Miles at 11 to 15 cents apiece we would definitely advise you NOT to buy miles at this price unless you are just shy of an award (say 100 miles) and need to redeem ASAP. Find out more here. I beg to differ on the AIr Miles purchase statement... there are some routes where it's a great deal. For example, roundtrips from Yellowknife to Iqaluit cost northward of $3600 on Canadian North. They can also be redeemed for 1200/1400 Air Miles (low/high season) which means you're getting over $2 per Air Mile. Ahh you are right Nunavut Wolf! The expensive flights in the North or to the North are huge value not only for Air Miles but also Aeroplan! I obviously suffer Southern Canadianitis and think of routes like YVR-YYC, YEG-YYZ etc. where it is not worth it to buy points and forget about the high prices you face up North. So yes in this case it can be a great value to buy AIR MILES!